Donald Tusk at Downing Street to meet David Cameron. During their discussions in Number 10, the PM said they agreed to work together “very closely” in the European Union where the two countries share similar perspectives on the need for greater competition, greater deregulation and a determination to make Europe a “high growth rather than a slow growth area of the world”. Mr Cameron also said the two leaders discussed the uprisings in the Middle East and North Africa and agreed the EU should support the popular revolts. The PM said the two leaders also discussed Poland’s role in NATO, hailing their ”strong, shared efforts” in Afghanistan. KRAKOW TOURS – A boxing promoter is trying to lure Mike Tyson out of retirement for a re-match with Andrzej Golota, when the American boxer is in Poland for three days in the autumn this year. 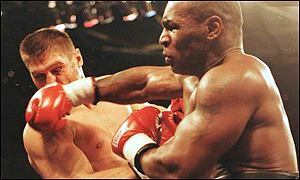 Golota faced the fearsome Tyson in 2000 when the Pole quit the bout at the beginning of the third round, after what his manager described at the time as a “panic attack”. The bout was later ruled a No Contest after Tyson tested positive for marijuana. “I want the two fighters meet again,” boxing promoter Tomasz Babiloński has told a tabloid newspaper in Poland. ”We’re currently in preliminary talks with Tyson’s manager and we have agreed that he will be in Poland for three days, starting 8 September,” Babiloński told the Fakt newspaper. The bout between the two retired fighters will probably not happen, of course, and is probably merely part of the hype surrounding a visit by Tyson to Poland, who could be taking part in a boxing gala in the country. The promoter would be pleased if the two old bruisers sparred at each other a little in the gym. Tyson, one of the most feared of all heavyweight champs when he was in his pomp, will earn around 100,000 USD during his trip to Poland, plus accommodation and flights – two business class tickets and three in the economy for his entourage. Golota last fought in 2009, when he lost to Tomasz Adamek in five rounds. Tyson was last in the ring in 2005 when he was TKO-ed by Kevin McBride, who Adamek faces in Newark at the weekend.